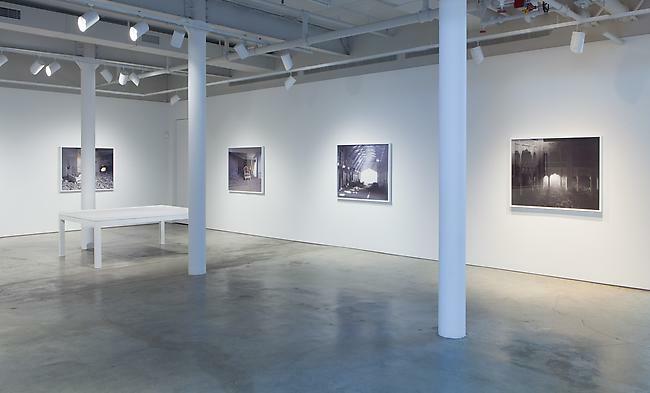 DRISCOLL BABCOCK GALLERIES presents Wafaa Bilal: The Ashes Series, the artist’s first solo exhibition with the gallery, featuring a suite of ten photographs and a durational performance piece. In this body of work, Bilal offers meditative and ephemeral moments which address erasure and violence in the aftermath of war. By re-visiting recent history, and altering the images of the past, he intentionally creates tension and incongruity, exploring the duality that exists between the sacred and the profane through photographic practice. Bilal’s reconstructions are testaments to his landmark artistic innovations which integrate photography, technology, and the literal human body. 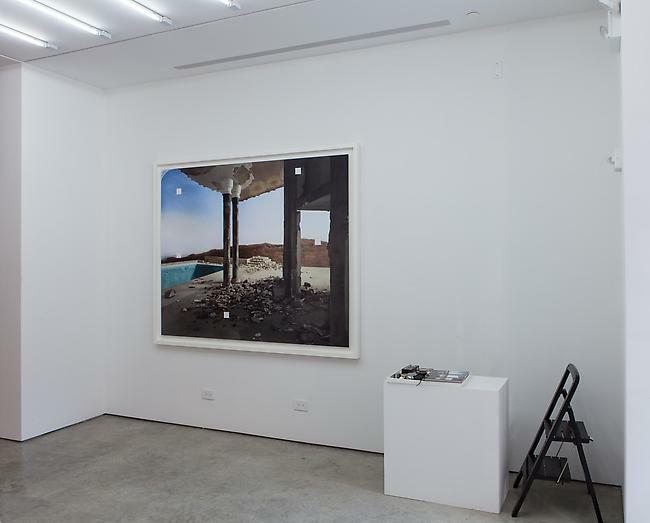 In The Ashes Series, Bilal presents photographs of handmade models which he based on a collection of mass-syndicated images documenting the aftermath of Operation Iraqi Freedom. The human presence is represented by 21 grams of human ashes that reference the mythical weight lost by the departure of the soul from the body at the time of death. The resultant monochromatic whiteness of the ash adds to the unavoidable quietness—of a chair persistently standing amidst the rubble, Saddam Hussein's unmade bed, or a lone hospital pillow left behind. Yet this poetic act also troubles the serenity of the scenes, highlighting the afterimage of conflict and the proverbial dust that will never settle. In Bilal’s durational performance piece, Erasing, the artist ritually selects a square to be cut and removed from a photographic image of Saddam Hussein’s destroyed palace. He then archives the squares as if they were dissected specimens. These fragmented pieces of information call out for further investigation and understanding. Each detail of the process—from the artist’s time of arrival, to the formal aspects of the selected square—is fully documented. Bilal’s direct and particular interaction with the image allows him to revisit his native country of Iraq, from which he can no longer physically return, and create further distortion of the image through the filter of personal contemplation, while also inviting the public to engage in the profane from the safety of the gallery setting. A full-color catalogue accompanies the exhibition. 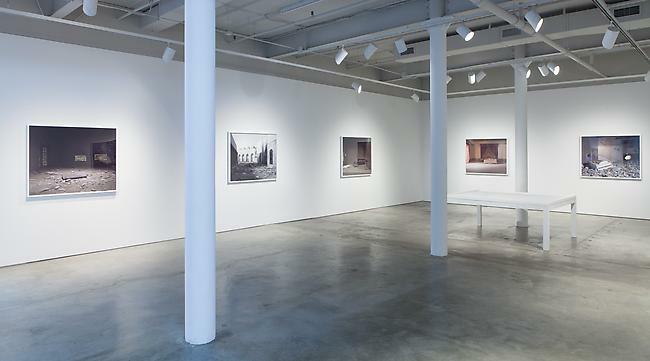 Wafaa Bilal has been exclusively represented by Driscoll Babcock Galleries since 2013. Bilal’s work is represented in major public collections, including Mathaf: Arab Museum of Modern Art, Qatar; Museum of Contemporary Photography, Chicago; Milwaukee Art Museum; and the Los Angeles County Museum of Art, California. He has exhibited extensively in galleries and institutions throughout the world, including the US, Thailand, Iraq, the UK, Dubai, Lebanon, France, and Germany, and he has served on the panels of over twenty major global universities and institutions, including the Tate Modern, UK; Harvard University; Stanford University; Museum of Art and Design; the Global Art Forum, Qatar; and the Inter-Society for the Electronic Arts, Turkey. His work has been reviewed in major publications, including ARTnews¸ Art in America, The New York Times, The Wall Street Journal, and Newsweek, and he is the author of the critically-acclaimed 2008 publication Shoot an Iraqi: Arts, Life and Resistance Under the Gun. Bilal graduated from the University of New Mexico and then obtained an MFA at the School of the Art Institute of Chicago. He currently lives and works in New York as an Associate Arts Professor at New York University’s Tisch School of the Arts.